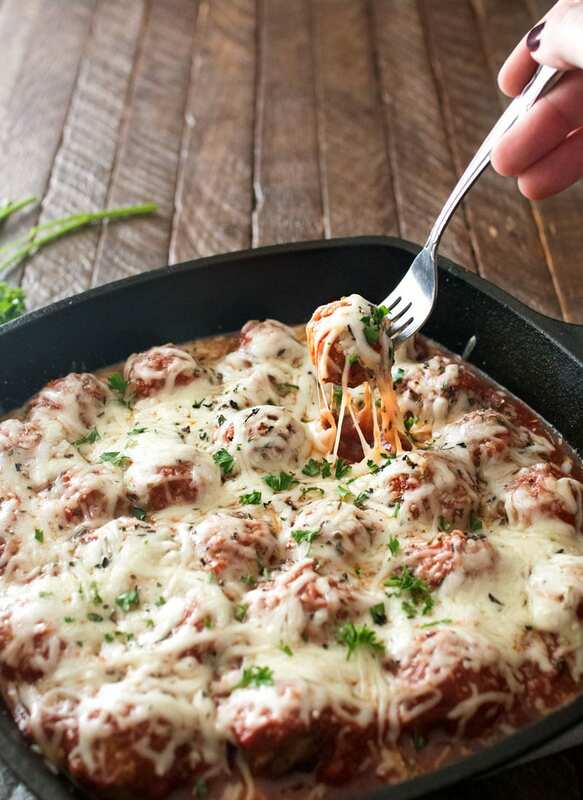 This hearty meatball Parmesan bake combines homemade meatballs, marinara, and Italian cheeses in one skillet or pan. Perfect for subs, pasta, and more! 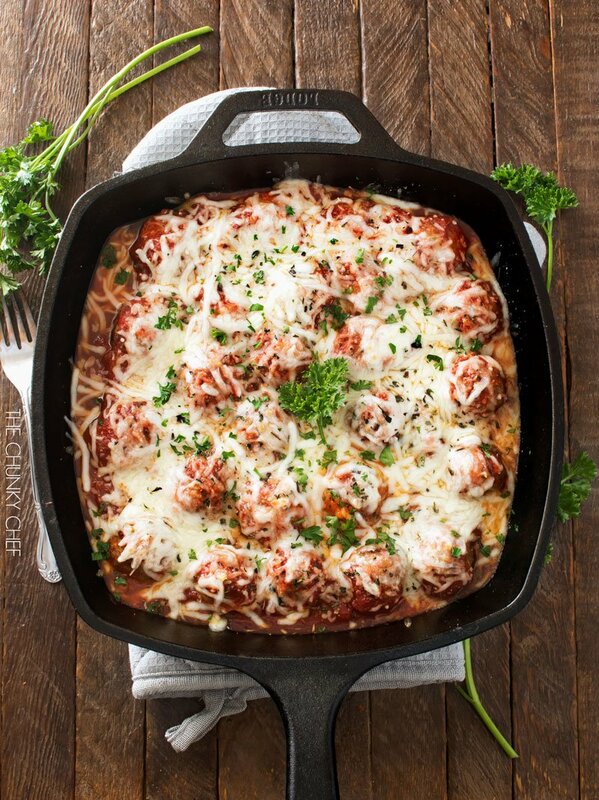 Velvety soft homemade meatballs combine with robust marinara sauce and savory Italian cheeses in this ultra hearty meatball Parmesan bake. 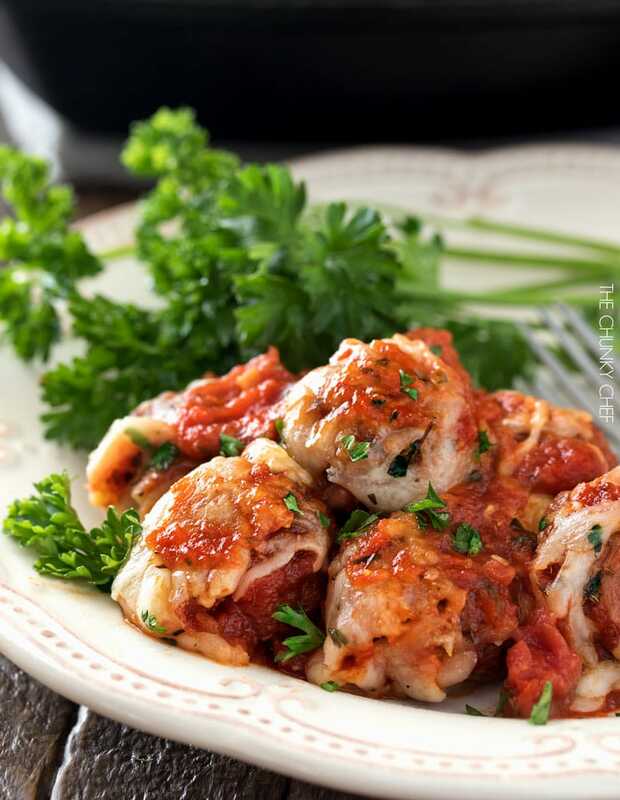 Serve these meatballs with pasta, use them to make meatball subs/sliders, or just serve them along with a crusty piece of bread! Okay guys… doing a little flashback here (throwback… Monday? ), to my very FIRST post ever (back in 2014). I was going to just republish it, but knowing what I now know about SEO (search engine optimization), that old post is pretty, well, bad. Basically in order to optimize posts for the web (aka, the all-mighty Google), you need to have a strong keyword, metadata, subheadings using the keyword, etc… and that original post doesn’t even have a keyword, and the title is all kinds of screwed up lol. I’ve still left it up, so if you wanted to hop over, feel free to here. Here’s the original photo from 2014… but promise me, no laughing! I’ve gone back and forth a few times about just deleting that old photo, but I actually kind of like it. Certainly not because it’s a good photo… technically it’s actually a pretty terrible one, but I like it because of what it represents. When I posted that recipe, with that photo, it was a HUGE step for me. 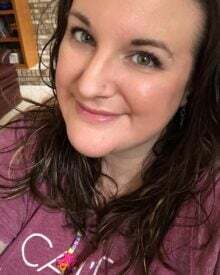 Introverted, shy, and definitely not one to “put myself out there”, I tentatively dipped my toes in the blogging waters. I fully expected to fail. But what I discovered instead was an incredible passion… a hunger and purpose. And here I am just about 2 years later, blogging full-time, as a career! This recipe. OMG. We have it a LOT here for dinner, because it’s just so delicious. It can be a bit time consuming if you make it straight through at once, but I’ll give you some tips below on how to make this faster and easier to prepare! The buttery-soft homemade meatballs are definitely the star here. 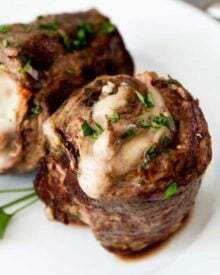 They’re so melt-in-your-mouth due to a great combination of equal parts beef, pork and veal (but feel free to omit the veal and just use beef and pork if you object to veal), and soaking the breadcrumbs in milk before adding them to the mixture. I know some people have issues with cooking tomato based sauces in a cast iron pan (it can cause a slightly metallic taste and can potentially strip the seasonings off your pan), but if you have a WELL seasoned cast iron pan, it shouldn’t be an issue. 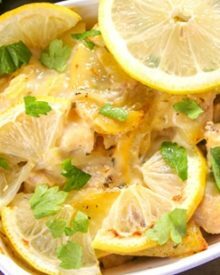 I use my cast iron pans for nearly everything, so they’re very well seasoned, but I wouldn’t cook this recipe in a newly purchased pan. 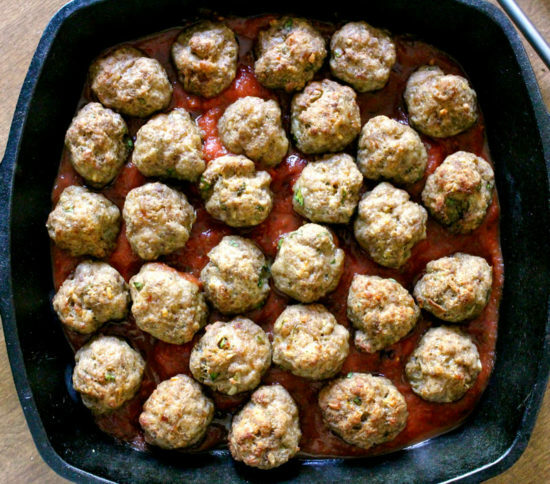 To be safe, you could use an enameled cast iron pan (like this one), or bake your meatballs on a baking sheet them transfer them to glass baking dish (like a 13×9″). 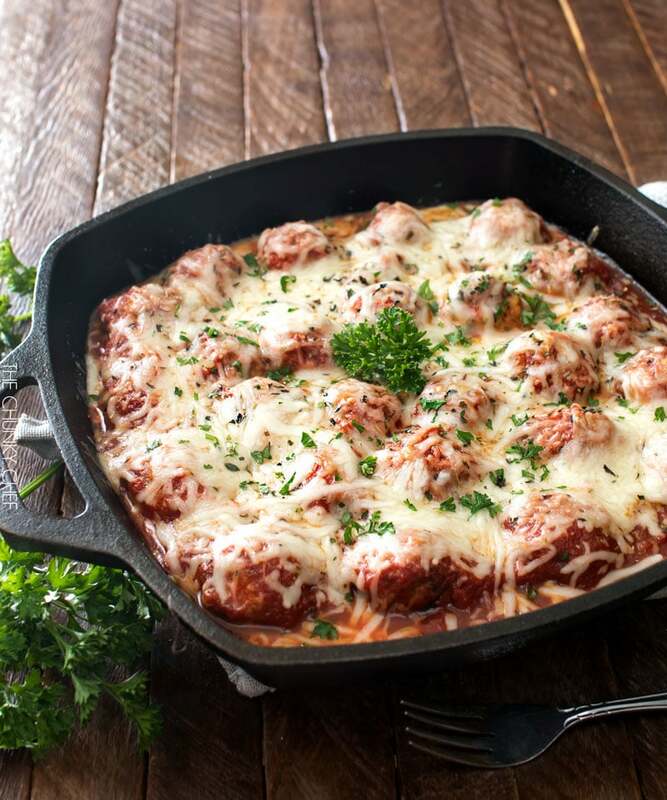 We love to serve this meatball Parmesan bake as is, with a salad and some nice crusty bread… but it’s also amazing with pasta, or even put onto a bun for the most delicious meatball sub you’ve ever had! 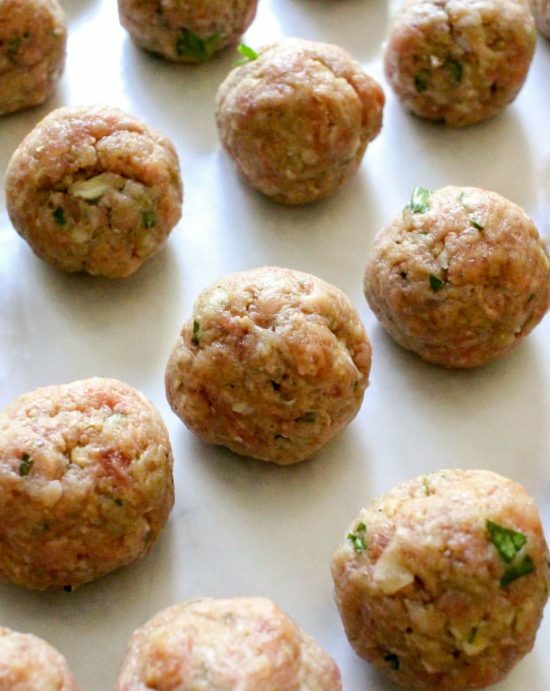 Make meatballs ahead of time and keep refrigerated until ready to use. LODGE SQUARE CAST IRON SKILLET – This is the pan used in this recipe/photos… it’s the perfect size! LODGE ENAMELED CAST IRON BRAISER – If you’re not comfortable cooking a tomato based dish in a regular cast iron, this is an excellent alternative! SMALL COOKIE SCOOP – This little miracle makes the perfect sized meatballs, with hardly any mess! 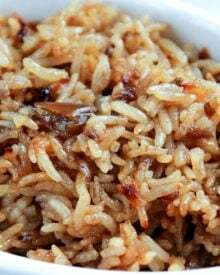 Preheat oven to 400 degrees F. Line an oven safe skillet with foil and set aside. In a small mixing bowl, mix breadcrumbs and milk. Set aside. Mix ground meats, garlic, breadcrumb mixture, Asiago and Parmesan cheese, parsley, eggs, salt and pepper, by hand until just combined, being careful not to over-mix. Use a small cookie scoop and form ping pong ball sized meatballs. Spray prepared foil-lined skillet with cooking spray and place formed meatballs on the foil. Lower oven temperature to 375 degrees F.
Place meatballs on a plate and remove foil from skillet. Pour about 1/2 cup marinara sauce in the bottom of the skillet and spread to cover. 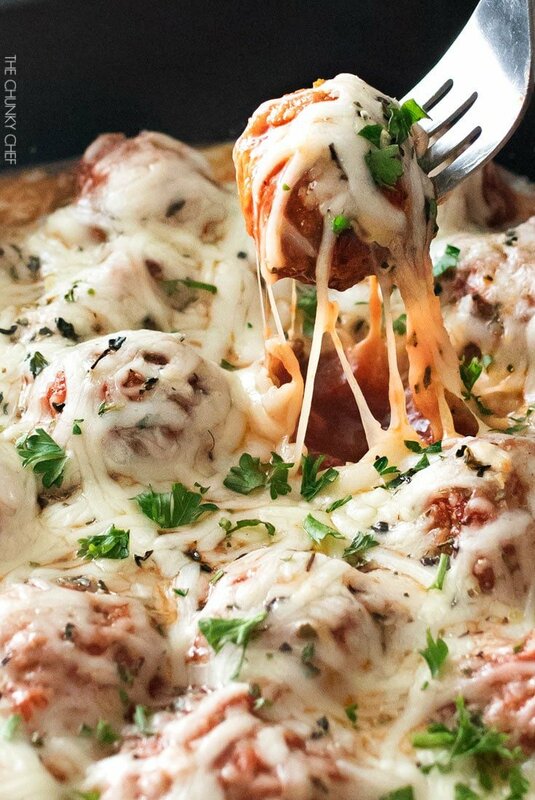 Place meatballs in skillet in a single layer. 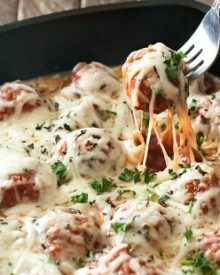 Pour remaining marinara sauce over the top of the meatballs, then sprinkle shredded Italian cheeses over the top, so all the meatballs are covered in cheese. Drizzle a little bit of olive oil over the top of the cheese, then sprinkle with Italian seasoning. Cover skillet with another piece of foil and bake for 20 minutes. Remove foil and bake, uncovered, for another 20 minutes. If desired, broil the dish for a minute or two after baking. If you prefer not to use ground veal, substitute it with an equal amount of additional ground beef or pork. Next Post » Favorite Fall Donut and a Giveaway! You’re not a pest at all! I would freeze after the 20 minute bake, and assembling the sauce and cheese. I have the meatballs in the oven right now, but I had three that didn’t fit on the sheet pan that I fried up and ate for my lunch just now. Super tasty! I thought I made pretty good meatballs, but apparently I was wrong. Made meatballs as directed (sans breadcrumbs, Keto). They had tons of flavor and will be my go to recipe for meatballs. 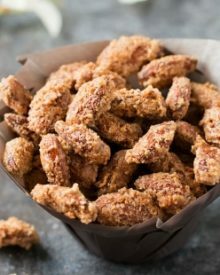 Thanks for posting and I will follow and continue Keto-izing your recipes for our enjoyment. Hi there, if I’m freezing some meatballs for later (I’m only feeding myself) would I cook them the 20 minutes first then freeze or just freeze in the raw form? Thanks so much! You can do either way! Do.you have any tips or tricks to make this ahead of time. My son has football until 7:30 so I don’t have time after the game, but I have plenty of time before hand. Help? 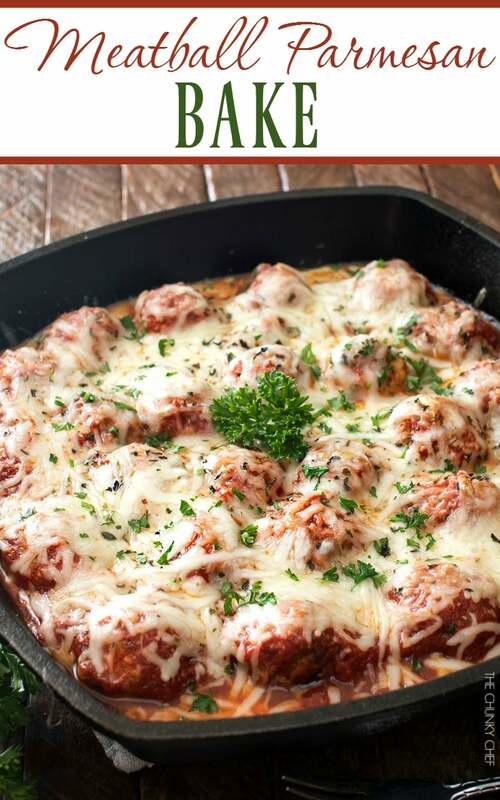 Hi Mattie 🙂 I’ve never tested the recipe this way, so I can’t guarantee the results… but I think you could bake the meatballs as directed, then instead of baking the meatballs in sauce; add the baked meatballs and sauce to a slow cooker, cover and cook on LOW for 6 hours, or high for 3. 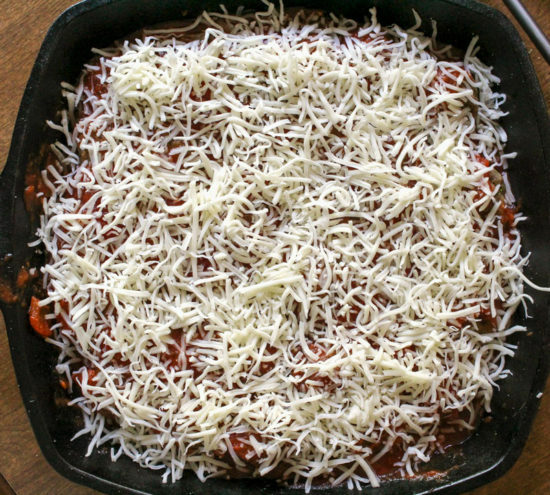 About 30-40 minutes before you’re ready to eat, go ahead and top the meatballs/sauce with the shredded cheese, cover, and cook for 30-40 minutes until cheese is melted. I have 4 kids and sometimes I will bake a recipe in my removable crock pot dish (the actual crock, no lid) and then keep it on low or warm in the crock pot until we can eat. I love this idea! So smart. Wonderful recipe, just put together and smells delicious. Won’t know for sure until we eat it. 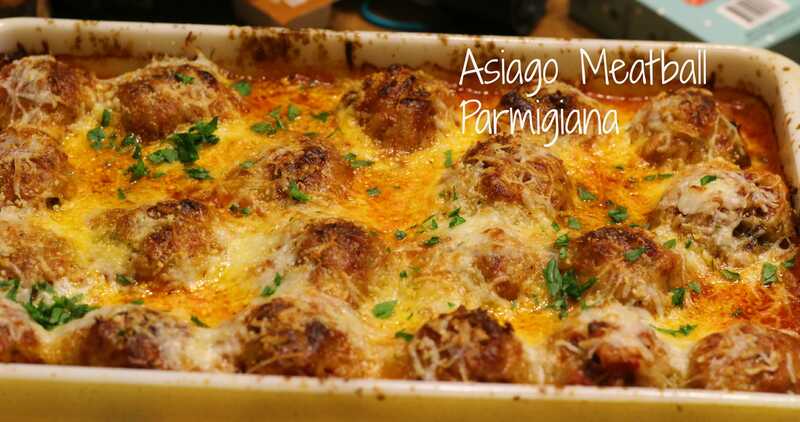 Served with mostaccioli noodles and crusty Italian bread….yum! The meatballs are in the oven now-just one question. When I mixed the milk and bread crumbs, it got very thick, and was difficult to get mixed in well-any hints, or is that what’s supposed to happen. Can’t wait for dinner! Thank for the reply-for the record-this was FANTASTIC! Going into the regular rotation at our house. I would love to make this for dinner tonight my only problem is there are only 2 of us 4 that like spaghetti sauce. So normally when I do meatballs and spaghetti I baked the meatballs plan then add some to the sauce for the spaghetti eaters. I am wondering how this can be done and used for BOTH subs and spaghetti in one? 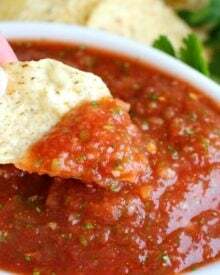 Would you just use more of a plain tomato sauce to bake then add spaghetti sauce once separated? Or if I baked in marina sauce then added spaghetti sauce would that taste nasty or funny to the spaghetti eaters?? LOL thank you! If using frozen meatballs, should I cook those first? Then put everything back in the oven so that the cheese melts and the marinara sauce is hot? Thanks in advance. Hi Kaycee 🙂 I would bake them about halfway, then let them finish cooking in the oven with the sauce and cheese. Made them. Love them. OMG amazing. Silly me, I spaced and forgot to add the eggs. However, you couldn’t tell! They still had a perfect texture and stayed bound together! So, for those with an egg allergy…no fear! I also used latex gloves to mix the meat for a mess free evening. 🙂 Thank you for this recipe! This was great! I made this for our anniversary and hubby loved it! The texture was a lot smoother with the mix of ground meats. Hi Melody 🙂 So happy to hear that you both loved this meatball bake!! Your updated photos are amazing Amanda ???? Give me this for dinner! It looks wonderful. I love cooking in iron too. Good info on cooking with tomatoes in iron also. This is complete and total comfort food!! Congrats to you for 2 yrs of blogging and making a career out of it. I know what you mean about those beginning photos (even though those first meatballs to me looked delicious!!). 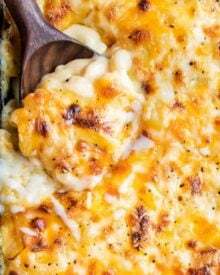 Great fall dish for a busy school night!! We LOVE meatballs in our family! Definitely going to have to try these! Oh goodness, this looks absolutely delicious! Paired with a salad and some garlic bread, I can’t think of anything more comforting! First off,this looks sooo good! I love good comfort food especially in the fall. You also inspired me to start re doing some of my older posts. 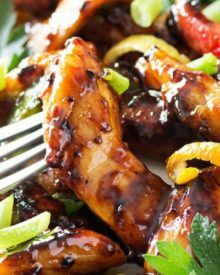 The pictures are scary but some of my favorite recipes 🙂 love your blog!